YouTube is one of the best ways to get video content to your digital sign. Just about anyone can create a video and upload it to YouTube. 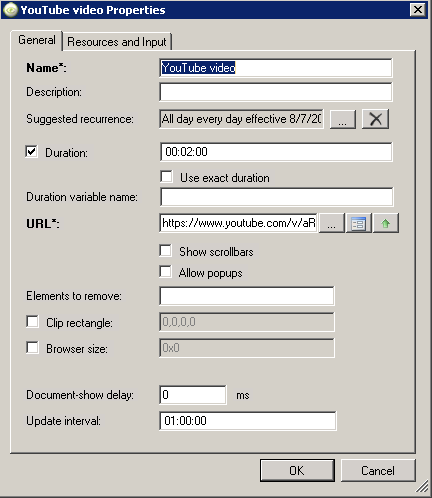 Videos on YouTube are streamed over the network. Thus, it’s best if the digital sign is connected to LAN rather than wireless to improve performance. Most digital signs do not have attached audio speakers. Keep this in mind when playing a video. Right-click your unit's content folder, choose New Content in The Category (unit), and then click HTML. Tip: adding 2-3 seconds allows for loading time. Use as many of these parameters as you need. http://www.youtube.com/v/eqTmtY-gytw This displays the original video in full-screen mode. http://www.youtube.com/v/eqTmtY-gytw&showsearch=0&autoplay=1&rel=0 This applies all of the plarameters mentioned above. Note: If appending the URL does not work, an alternative method is to add the parameters in the Dynamic URL properties. Click Dynamic URL and then click Parameters (circled below). Drag the new content object to the appropriate region in your template on yor player. On the properties window of the object, copy the URL and paste it in to a browser on your local machine. Verify that it plays correctly. Note: copy the properties window URL as it contains all of your included switches. Update IE and flash on content player machine. Try opening the video in a web browser on the actual player to verify that it plays correctly. Add the URL as a trusted site.